Check your property CTS value. Disclaimer : The Values and calculations provided on this website are for reference only. Kindly contact a real estate professional to calculate final amounts stamp duty/ registration etc payable. 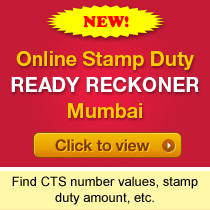 This Online Stamp Duty Ready Reckoner will be helpful for Individuals, Stamp Duty Consultants, Property Registration Experts, Property Lawyers and other real estate professionals for determining property values based on the CTS numbers and corresponding values. You can easily search for Ready Reckoner values (market values) for properties as per property location / village, CTS No, Zone & Sub Zone anywhere, anytime. You can do calculations for Residential Flat, Bungalow / Duplex / Row House, Commercial Office, Shop and Industrial Unit on the click of your mouse or even on your mobile. The online Ready Reckoner calculation can be done on Carpet Area or Built-Up Area. Understanding Calculations - Simple Help Document provided to help you understand all property valuations, stamp duty calculations, etc.